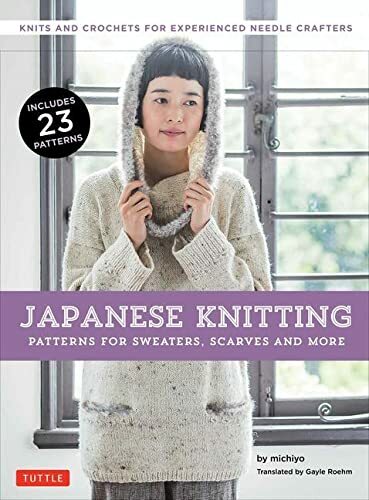 I recently purchased the book Japanese Knitting: Patterns for Sweaters, Scarves and More that has been translated into English and published by Tuttle Publishing. They also recently published the Japanese Knitting Stitch Bible, also a translation. I have a number of Japanese stitch dictionaries but have shied away from the pattern books in Japanese, feeling concerned that there is too much I’d have to puzzle out. This book is translated to English from the original Japanese but it keeps the format and style of the original patterns, which are much more brief than modern American patterns. It also includes a special five page introduction to Japanese knitting patterns for English readers that explains how the patterns are traditionally laid out. I think those five pages were worth the cost of the book because they have given me more confidence to look at the Japanese language pattern books again next time I am at a Japanese bookstore. My favorite pattern in the whole book is F Poncho and Cardigan, a garment that can be worn both as a poncho style garment with sleeves or as a circle style cardigan. It’s one of several two way garments that caught my imagination both as a knitter and as a designer. I have yarn on the way and hope to start working on this one soon! Despite being called Japanese Knitting, there are several crochet patterns included that have a very fresh look and interesting surface texture. I particularly like P Vest and Stole, another two way garment that can be worn both as a long vest or as a wrap. Many of the garments use simple shapes to make elegant silhouettes and would not be difficult to knit. The English version helpfully includes cm to inch conversions on each pattern page for the measurements listed for that pattern. It also includes a chart that gives you more details about the yarns used in the patterns, which are difficult to find outside of Japan, so that you can make effective substitutions. Overall, I’m happy to be able to add this book to my collection and I hope Tuttle puts out more of these gems!